The City of Wanneroo’s freshly repaired swimming enclosure will be back in place at Quinns Beach in February. The 85 x 300 metre eco-friendly enclosure was removed for essential repairs by the City’s contractor, Global Marine Enclosures, following severe winter storms. Mayor Tracey Roberts said many members of the community had been eagerly awaiting its return and delays to reinstallation had been caused by contractor supplies, and more recently, weather conditions. “Our residents appreciate having a local beach where they can swim in the ocean during the warmer months, without being fearful of large predators,” Mayor Roberts said. Late last year, reinstallation of the enclosure by the City’s contractor, Global Marine Enclosures, was delayed due to delays in manufacturing materials being delivered, and subsequent quality control testing by Global Marine Enclosures. The enclosure was due to be back in place by Australia Day, however reports of high swell and strong winds this week have prohibited installation, and the City did not want to inconvenience the public by closing beach access during busy weekends. The enclosure will remain in place until April when it will be removed prior to the winter storm period, before being reinstalled in October in time for the Quinns Mindarie Surf Life Saving (SLS) patrol season. Also happening at Quinns Beach in the coming weeks, is the installation of the new surf patrol tower. The tower will be installed during February and will remain in place until the end of the SLS patrol season in April. “The City of Wanneroo is committed to creating opportunities for our residents to be healthy and active, and we hope the swimming enclosure and patrol tower will encourage more members of our community to enjoy the great outdoors,” Mayor Roberts said. 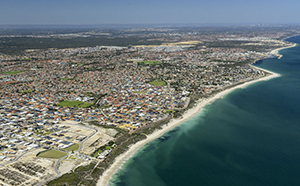 The City of Wanneroo recommends residents to refer to Surf Life Saving Australia’s website for beach safety advice.